Like most women, Island girl is always in search of remedies, products that keep the exotic skin in top form….after all there is only so much magic that FIJI water can do to one’s gorgeousness and well-being + juicing every morning is nice but cumbersome and these days I struggle to find time for at least one Moroccan bath a month. Help is at hand though in the form of In&Out as I am told by a few friends around town who are raving how the revolutionary new treatment from this latest Swiss skin care and wellness brand is redefining how you celebrate your beauty. Regardless of age or skin type, In&Out adopts an innovative and intelligent approach that promotes the balance of beauty and wellness both inside and out….how you may ask? Lucky for me I met the man behind the brand at the In&Out counter who graciously spent some time explaining how he and his wife decided to combine cosmetics, skin care and supplements together to ensure the skin was taken care at all levels. They combined powerful active ingredients made up of essential oil concentrates and food supplements of pure plant extracts, that work in extraordinary synergy with the science of cosmetology so that their treatments deliver triple action results that delay the skin’s aging process, keeps intact the body’s inner health, and stimulates the body’s natural defenses. For people who have an exotic colour like me, the In & Out Brightening Treatment range helps slow down the melanin production process which can result from a host of external, internal and natural factors such as stress, sun exposure and time. This reduces the causes and effects of pigmentation from inside and out, while gently brightening and evening the outer skin tone. There was something for every skin type and I’m sure you can find out more….i was more interested selfishly to find out what works for me. 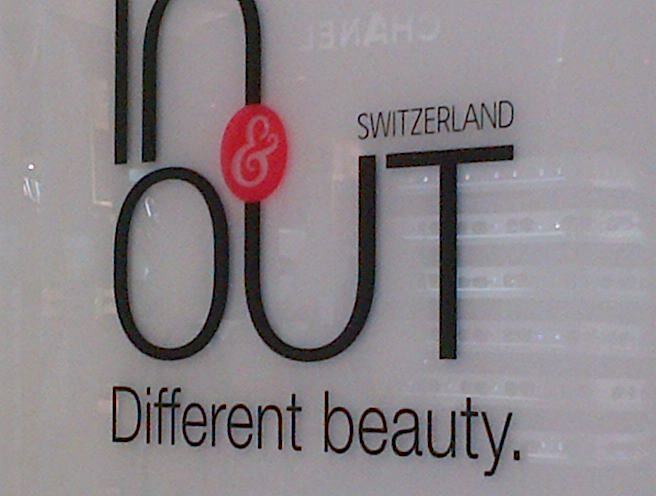 In & Out is awesome – I found them in Paris Gallery, Festival City, Dubai….hidden away but it was a worthwhile find as I’m done with superficial skin care.